As Bermuda’s footballers prepare to take on the Bahamas this evening [Mar 25], the presidents of both the Bermuda cycling and athletic associations have thrown their support behind the team, and are calling for residents to fill the stadium to capacity for the home game this Sunday. Later this evening, Bermuda’s national football team will get their 2018 Russia World Cup campaign underway with a match against the Bahamas at the Thomas A Robinson Stadium in Nassau, Bahamas. The players will all then head to Bermuda, where our team will take on the Bahamas at 3.00pm on Sunday, March 29th, at the National Sports Center. Tickets for that match are available online at www.ptix.bm, or in person from Freisenbruch Meyer and the BFA Office. The players named to the team are Nahki Wells, Freddy Hall, Dale Eve, Jarreau Hayward, Tyrell Burgess, Jaylen Harvey, Dante’ Leverock, Jaylon Bather, Keshien Bean, Drewondae Bascome, Cecoy Robinson, Mauriq, Tre Ming, Marco Warren, Zeiko Lewis, Jahnai Raynor, Reggie Lambe, Justin Donawa, Rai Simons and Jonte Smith; while the Standby Players are Antwan Russell, Donte Brangman, Lejaun Simmons, Taurean Manders, Casey Castle, Stefan Dill, Terrance Webb and William White. In a message to the island’s sporting bodies and included in the BBA newsletter to their cycling members, Mr Dunne said, “Do you remember when you were a kid and dreamed of winning that big event and, almost always, the imaginary announcer would say “and the crowd goes wild!”? “As you know our national football team will continue it’s campaign to qualify for the 2018 World Cup in Russia this Sunday, March 29th at the National Stadium against Bahamas and I would encourage you and your federation’s members and all of Bermuda to go to the stadium in support of our team. “All of us, at one time or another, have lamented the lack of public support for our national athletes and this is an opportunity for us to lead our community in rallying for our team. Mr Dunne continued, “Imagine the atmosphere in the stadium if it was filled to capacity with fans in red and blue, waving our flag and making all sorts of noise! This is what all athletes dream of and we can be the ones to help make this a reality a few days from now. “The Bermuda supporters should be lifting our teams to a new level of performance, instilling greater confidence in the athletes while swelling the supporters with the national pride often mentioned by YS&R Director Norbert Simons. 5. Be noisy, let them know you are there. Donna Watson, the President of the Bermuda National Athletics Association, echoed Mr Dunne’s sentiments saying, “I will definitely be there and will encourage my Association to attend. As I stated at the Sports Awards, it is a great feeling to have the stands full and have Bermuda behind you as we had for three days for Carifta. “I believe we have a great team and we would really boost their confidence if the public of Bermuda supported this event. They need to go to the radio stations, talk shows and build this up so that the supporters come out in the red and blue and with their flags. “As I stated there is no greater feeling when you are putting on an event to look at the stands see the red and blue, see the flags flying and every seat in the house is taken with standing room only. “Let’s support the Bermuda Football Association!” added Ms Watson. Does anyone know where we can stream this game (tonight’s and Sunday’s) if we’re living abroad? @Jon, speaking for Sunday…video streaming is not permitted. The match tonight in the Bahamas we are too not sure on, but if anyone reading this comes across a stream do please leave the link! So virtually every professional game in the world is publically screened here in various places, but this game is not permitted? Remember though, these are small nations with limited fanbases, not every international match gets streamed live. I haven’t came across no streaming but you can get play by play commentary on Fox soccer. Save $20 a ticket if you dine at Bermuda Bistro this week wether iit’s a burger or a lobster but dine in only GO BERMUDA. We have tickets tickets now at Bermuda Bistro so don’t delay and enjoy your meal served by Bermudians for Bermuda. That’s actually a decent promo. Well done Bistro at Beach. With the cost and so many out of work, we will see what the turn out going to be like!!!! Perhaps, although I don’t think the cost is too prohibitive. How much are tickets and where can we get them? Tickets for that match are available online at http://www.ptix.bm, or in person from Freisenbruch Meyer and the BFA Office. however Rick was saying Bistro is giving $20 on tickets if you eat there (DINE IN ONLY). Bermuda is IMPRESSIVE GREAT JOB TO ALL ! Great job in The Bahamas, Bermuda! We are proud of you all. Let’s do it again on Sunday. 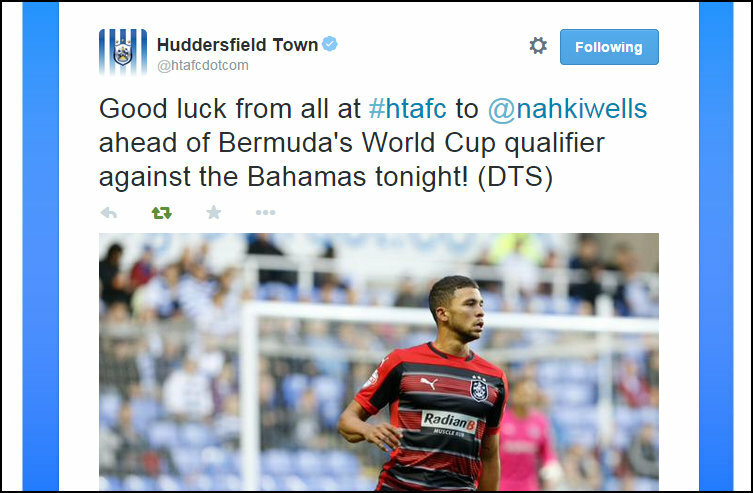 Bermuda, we need to pack the Stadium and give the team 100% support!